In 1936, the population of Arlington County was 40,000. There were 74 farms, 25 businesses, two ten-cent stores, one theater, one post office, and five community libraries. Four of the libraries - Aurora Hills, Cherrydale, Clarendon (which closed when Central was built) and Columbia Pike - had been established by citizen groups, while Glencarlyn had been built as the result of a bequest. All housed collections of mostly donated books and were operated by volunteers. Realizing the advantages of combining their forces, the groups organized the Arlington County Library Association in 1936. The County Board appropriated $3,000 for the new library association in July of 1936, so each library could buy at least two encyclopedias and an unabridged dictionary. The following year, the Department of Libraries was established as part of the county government, and the first librarian was hired. In 1944, the Holmes branch was added for the benefit of the African American citizens of Arlington. It was located within the George Washington Carver housing project at 13th and South Queen. It closed in 1950 when the project was razed to make way for new housing. 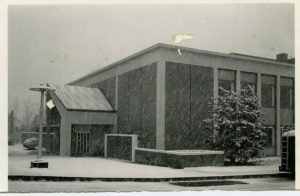 In response to the Library's need for more space, work began on the Arlington Central Library in 1960 - this was Arlington County's first publicly financed library construction. Central Library opened in 1961, and additions were added to the 1st floor in 1967 and the second floor in 1968. A renovation from 1990-1994 resulted in the present layout. In late 1971, Arlington Public Library became the first library in metropolitan area to install a video cassette system. The player, costing $700, and cassettes were located in the audiovisual room at Central Library. Accommodation Services began in September 1972, when Arlington Public Library was designated a "Subregional Library for the Blind and Physically Handicapped" by the Library of Congress. In 1975, a Books by Mail service was added. In 1980, Arlington Public Library joined the reciprocal area library borrowing program sponsored by the Metropolitan Council of Governments. Previously non-Arlington residents had to pay $10 each year to have an Arlington card. Today, Arlington residents can still get free library cards from other area library systems. In April of 1983, Central Library, Glencarlyn, Aurora Hills, Columbia Pike and Westover branches begin cataloging materials on the County's main computer. In 1988 the online Library catalog became at all locations and Arlington public high schools. And in 1995, the Library installed the first internet terminals with help of $20,000 LibraryLink grant. Two public work stations and one reference station were located at Central Library. Seven other library systems in the United States also shared in the program. Read more in "A Brief History of the Arlington County Library" by Jeanne Rose (1958), located in the Center for Local History.